Idaho Springs, steeped in historic mining culture, is a true “gem” in the heart of Colorado rafting country. This town offers a great small town feel that includes ma and pa restaurants, an amazing local brewery called TommyKnockers, and it’s world famous Beau Jo’s Pizza, a Colorado style mountain pie that will take the whole family to finish. From the incredible Clear Creek that carves through the town, to it’s rich history in gold mining this is one town not to miss on your way through the Rockies. Here are three other things to know about this charming roadside town. Idaho Springs is the gateway to Mt. Evans, one of Colorado’s most glorious 14ers. At 14,265 ft, this mountain towers high above. Not feeling up for a hike? That’s no problem, as a stunning mountain highway takes you almost right to the summit for unlimited breathtaking views. Mt. Evans is also the closest 14er to Denver, so make the easy trip to enjoy this mountain marvel. Idaho Springs is a Colorado white water hotbed. With the raging waters of Clear Creek, this river is home to serious rapids, as high as Class V. These waters are full of family rafters, as well as seasoned veterans, testing their river worthiness. Idaho Springs is also home to a world class cliffside zipline course that takes you over the cliffs and mountains of Clear Creek county. The views are second to none as you challenge yourself on this cliffside course. Basically the adventure never ends! 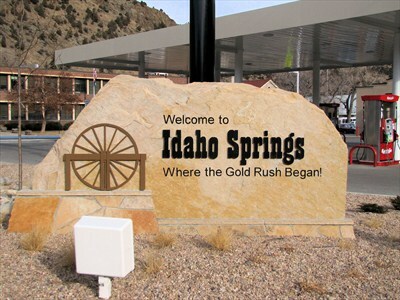 Idaho Springs is the site of the first significant discovery of the Colorado Gold Rush. George Jackson found gold at the confluence of Chicago Creek and Vasquez Creek on January 7, 1859. The town boomed throughout the 1860’s – reaching a peak population estimated at over 12,000 people. The history in Idaho Springs, as briefly touched upon above, is rich and varied. Now is the time to check out this old-school mining town, so book now to take your family or group on an informational train ride, zipline over old gold mines or get your feet rafting down the clear creek! Whatever your preference, this small town just 30 minutes from Denver has it all! Sign up for deals, trip info, and more!